Yesterday, we went to Waynesboro to Papaw's house to eat shrimp and visit with the cousins. My sister and family from Huntsville came in and also Nik's mom (Granny Nan). 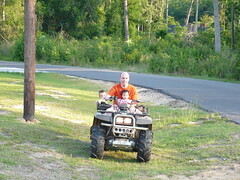 Addison took her first four-wheeler ride and loved it. Of course I had to ride too, just to make sure Nik was going nice and slow! Addison was still very shy during the visit. She kind of sat back and watched while cousins Sarah and Ben played. She did play with the pots and pans for a little while with Sarah until she got the bright idea to stick some of the play utensils right through Papaw's deck. Sarah got a little upset about that and ratted Addison out. The day was beautiful and the temperature was great! Here are some more pics of our day.